After numerous delays, Marvel’s blockbuster event draws to a close with the extra-sized final issue of Civil War II. Showing great promise in its first couple of issues, Civil War II quickly slid comfortably into a by-the-numbers comic event rhythm. That being said, the event did produce some standout moments (the vision of Miles Morales’ Spider-Man killing Steve Rogers’ Captain America on the steps of Capitol Hill being particularly vivid and unnerving) and David Marquez’s art has elevated each instalment above mediocrity, but on the whole it failed to be anywhere near as ground-breaking as Mark Millar and Steve McNiven’s original Civil War. In favour of this final issue, Brian Michael Bendis and David Marquez deliver some exciting edge-of-the-seat action with Bendis maintaining the tension and drama and Marquez presenting his amazingly detailed, blockbuster visuals as the conflict between Tony Stark/Iron Man and Carol Danvers/Captain Marvel reaches its climax. As with previous issues the moral debate is touched upon but never fully explored (a shame considering the strength of some of Bendis’ other work) and ultimately taking a backseat to those aforementioned blockbuster elements. 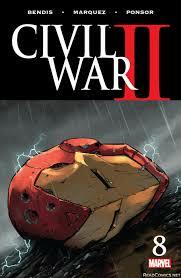 Given that the delays Civil War II has faced meant its finale following the release of several relaunched ‘Marvel Now!’ titles, the conclusion – specifically the fate of Tony Stark – is unsurprising given what we’ve seen in Infamous Iron Man and Invincible Iron Man but it non-the-less still carries some dramatic weight as the path is paved for the future of the Marvel Universe. Perhaps that’s where the problem lies, with the need to establish the status quo of Marvel’s latest line-wide shake-up it’s left less room from Brian Bendis to really delve into the commentary of Civil War II. In the end, taken as a whole Civil War II was an enjoyable albeit undemanding blockbuster event that is unlikely to be heralded as a classic in years to come but may still be worthy of a revisit when the dust has settled. It’s not the greatest story Marvel has delivered in recent years but it’s also far from the weakest. The bottom line: Whilst Civil War II ultimately failed to live up to the potential of its premise, this final issue succeeds in delivering some great moments of action and drama with a fitting conclusion that establishes the future of the Marvel U. Civil War II #8 is published by Marvel Comics and is available in print and digital formats now. Marvel’s grand event comes to a close in the final issue of Civil War II (cover art by David Marquez). Following the colossal success of The Force Awakens, Rogue One sees Disney/Lucasfilm unleash the first of their standalone ‘Star Wars Story’ anthology films to help sate the cravings of audiences whilst they await Episode VIII. Such a project could easily be labelled as greedy and corporate minded, but luckily Rogue One proves its worth as a satisfying and engaging addition to the Star Wars universe. Set prior to the opening events of 1977’s Star Wars – now retroactively known as Episode IV: A New Hope – Rogue One slots comfortably between the prequel trilogy and those much beloved and iconic original films without feeling contrived or unnecessary as it embellishes A New Hope by telling the story of the Rebel Alliance’s daring mission to retrieve the plans for the ‘Death Star’, the evil Empire’s new devastating, planet-killing weapon. Felicity Jones (The Theory of Everything) is a strong and capable lead as convict-turned-Rebel ally Jyn Erso, daughter of Imperial Scientist Galen Erso (Mads Mikkelsen) who, together with Rebel Captain Cassian Andor (Diego Luna) assembles a rag-tag band of fighters including Chirrut Imwe (Donnie Yen), a blind man who is strong with the force, his companion Baze Malbus (Wen Jiang) and defecting Imperial pilot Bodhi Rook (Riz Ahmed) to battle against Ben Medelsohn’s Orson Krennic and the forces of the Galactic Empire. Whilst Jones and Luna are clear standouts and best served by the screenplay’s characterisation, it’s reprogrammed Imperial droid K-2SO – voiced by Firefly’s Alan Tudyk – that often steals the show with a snarky and cantankerous attitude that provides much of the film’s dark humour and even some of its heart and soul. Mads Mikkelsen (most recently providing the villainy in Marvel’s Doctor Strange) makes the most of his limited screen time but at least gets to make more of an impression than Forest Whitaker who is criminally underused as the gruff Rebel fighter Saw Gerrera, a face from the Erso’s past who would’ve warranted further development along with Jyn’s earlier years to further flesh out her ‘rebellious’ backstory. Small quibbles aside, despite a slightly sluggish start Rogue One jumps to hyperspace once we get to the central plot, sending the viewer on an epic, action-packed ride that makes amends for any earlier narrative shortfalls and pacing issues. This is most definitely still a Star Wars film yet one that is more grounded in the nitty gritty of warfare (with subtle shades of Saving Private Ryan and Platoon) and doesn’t shy away from the grey areas of ‘good vs evil’, the more mystical elements of the franchise mostly restricted to Imwe’s sporadic ramblings concerning the force. It’s certainly all in the favour of Rogue One, mining some largely unexplored territory that enriches it all the more. Director Gareth Edwards (Godzilla) stages some incredibly exciting and visually impressive set pieces that easily rival the action of The Force Awakens, much like what J.J. Abrams achieved there’s a real sense of heft and physicality to the film’s elaborate space battles as well as its ground focused combat as Rebel soldiers take on the Empire’s Stormtroopers and X-Wings swoop in to tackle Imperial walkers. Rogue One not only looks great but also via its production design and costumes faithfully replicates the era of A New Hope as it was created by George Lucas and his team back in 1977. 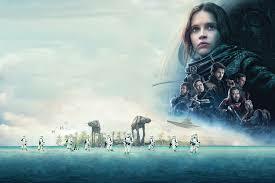 Yes, it can still be taken as a standalone story but for fans of Star Wars, it’s actually Rogue One’s connectivity to the overall universe and saga – complemented by numerous easter eggs and lashings of fan service (some more pleasing than others, with the inclusion of Darth Vader handled particularly well) – that is perhaps one of its greatest appeals. The bottom line: The Star Wars franchise continues confidently with the highly enjoyable and epically realised Rogue One, providing plenty of excitement for fans and casual viewers alike. Rogue One: A Star Wars Story is in cinemas now. Jyn Erso (Felicity Jones) leads a rebellious bunch against the Empire in Disney/Lucasfilm’s ‘Rogue One: A Star Wars Story’.